NPS Gottigere provides an exceptional scholastic base reinforced with a well structured curriculum to capture the interest of the students so as to develop them into responsible and contributing members of the society. NPS Kindergarten provides a holistic and integrated system of education. To grasp a real understanding of the world around him a child must observe, handle, play, explore and experiment with a plethora of things in his environment. Kindergarten gives an opportunity to learn through funfilled activities and engages in goal oriented activities like art, music, group games, songs, transforming playtime to instill important cognitive skills, motor skills and social skills. Through the process of play children learn to represent their real and imagined world using different skills like listening, speaking, reading, writing, role playing, painting, drawing, estimating and exploring. Stories are designed to assist in sensory and physical development and socializing. 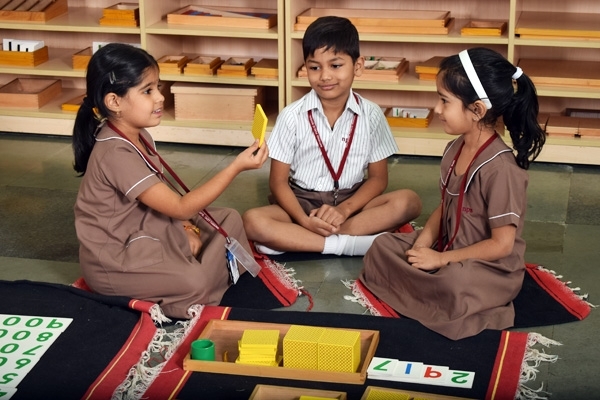 Play is an essential learning experience which enhances and enriches the students learning making it delightful and pleasurable to the learner and setting a stage for success as they move through the pre-primary. In the safe and joyful environment of Montessori at NPS–Gottigere, child centric educational approach is the key to instil values and overall development of the child. The mixed age group helps make learning memorable by refining hand-eye coordination, gross motor skills and stimulating their senses from visual to stereognostic. Interpersonal communication is fostered through communication between children, peers and adults too. The usage of sounds, words, phrases, sentences develops creative writing in children. Patterns of all kind like numerical and abstract help in study of science. Numerical concepts are made enjoyable through shape, space, numbers and their relationships. Fine arts like dance, music, storytelling, poetry and recitation inculcate a sense of community and richness of culture. Art and craft helps develop and improve motor coordination, concentration and orderly execution. As a part of curriculum, we invite parents for “Observation” during regular class activity where the parents get a first-hand experience in Montessori ways of learning and watch their loved ones actually participating in the process of learning. NPS Gottigere is affiliated to CBSE and offers a comprehensive and innovative curriculum which helps to bridge the transition for the little ones from Montessori to Primary an amiable and heartwarming process. Our trans-disciplinary framework focuses on stimulating the curiosity of the child as an inquirer, both at school and beyond. NPS also enforces children receive essential life skill training and leadership skills through project based and inquiry based learning. 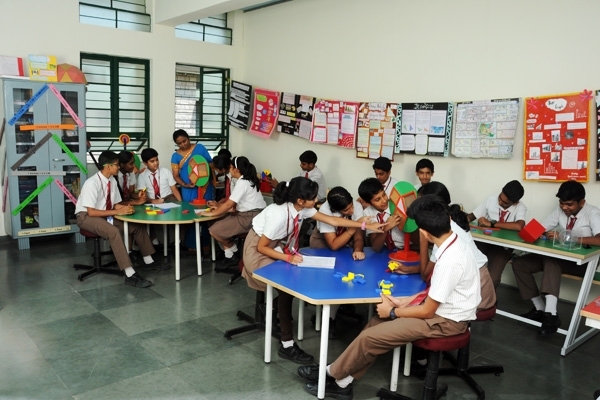 We follow the best practices of international curriculum and have emerged as one of the top CBSE schools in Bangalore South and offer a simple but structured curriculum focused around subject, personal and international learning goals. We strive ceaselessly to facilitate and provide a conducive learning environment through activity-oriented lessons and extensive co-curricular activities. As students move through the Primary School, we begin to introduce them progressively to the world of integrated knowledge, while particularly strengthening their aptitude in the core studies of English, Mathematics, General Science and Social Science. Our comprehensive Middle School curriculum combines strong academics with the necessary tools to develop independent learning strategies that offer a variety of learning experiences to fully equip your child for success in high school and higher educational pursuits. 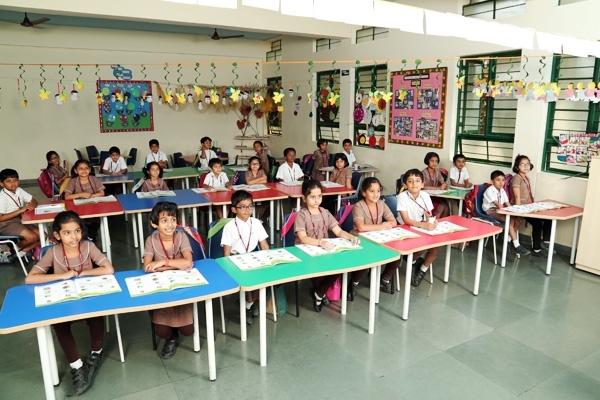 In Class 5, Sanskrit, Kannada and French are introduced as a third language in addition to the four core subject areas: Language Arts, Math, General Science, and Social Studies. In Class 6, Mathematics is split into Math-I and Math-II, General Science becomes more detailed as Physics, Chemistry and Biology and Social Science becomes more specialized as History-Civics and Geography. English, Hindi, Sanskrit and Computer Science continue to be in the program. Our 6th – 8th Grade curriculum focuses on students to develop independent learning strategies, further their reading comprehension skills, begin exploring advanced math concepts in preparation for higher level math courses, read classic literature and write original composition pieces, explore physical and life sciences, and study the geography, culture, and politics of the world around them. 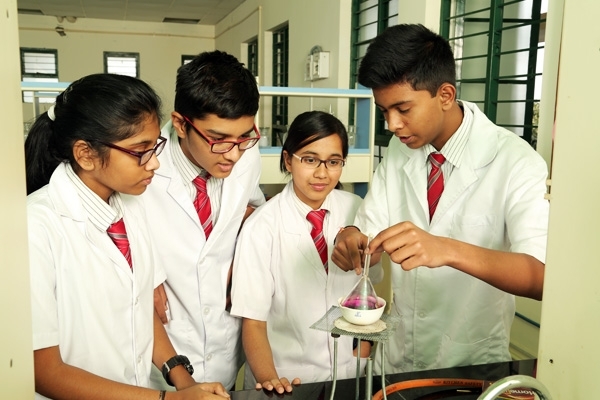 Our Senior Years curriculum is affiliated to CBSE which is uniform with a flexible scheme of studies suitable to the needs of every student. The board endorses innovations in teaching and learning methodologies by formulating student centered paradigms. It aims to develop students who have excellent breadth and depth of knowledge and who flourish physically, intellectually, emotionally and ethically. All students participate in physical education and health classes in a rotating schedule. They learn to apply critical reasoning, problem-solving, and thinking skills and strategies. Also, effective formative feedback encourages students to be independent and take control of their own learning.